This pre-bent disc brake line kit is made specifically to work with Ground Up's front disc brake conversion kit. 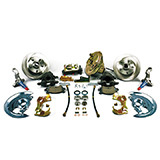 This kit includes front, front to rear, and rear brake lines as well as rear flex hoses and all clips. All lines feature correct bends and flares. Adding these lines to your disc brake conversion will prevent the headaches that come along with trying to bend your own lines.